Protection against the sun's ultraviolet rays with the lightweight and cool, Sol-Air sun sleeves. Eliminates the need for sunscreen! The white material stains readily. 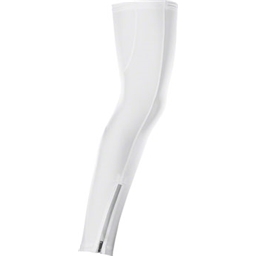 The articulated (panel) construction conforms well to the shape of the leg, especially important around the knees. I can pull them on and take them off over my shoes. The zippers seem sturdy and are highly reflective for added visibility at night. The gripper around the upper thigh works well enough, but only with the assistance of my inner shorts to keep them up without constant attention. The material is surprisingly cool and light enough that I carry two pairs when touring. Keeps my legs free of road grit.